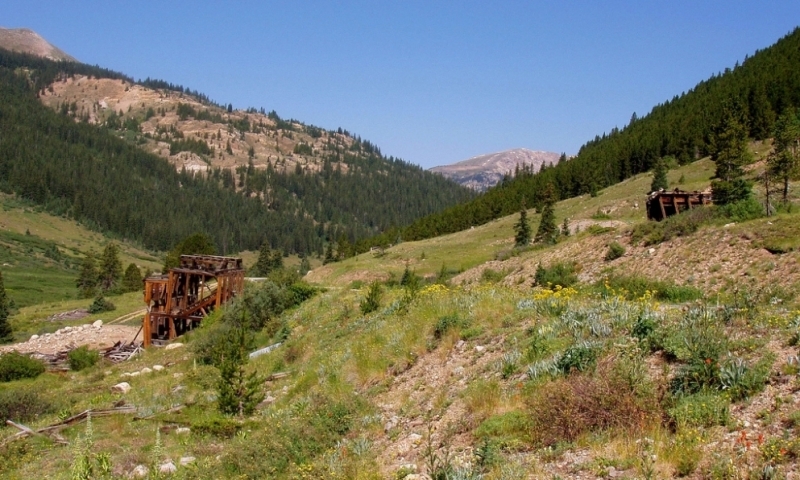 Independence Ghost Town, the wooden skeleton remains of a Colorado mining operation of the 1880s, provides historical intrigue, perfect in conjunction with a hike on trails easily accessible from Independence Pass Road. Located on Highway 82, 16 miles SE of Aspen, CO, on Independence Pass. In early Spring and late Fall, check Colorado Department of Transportation road closure updates for Pass status. Guided interpretive tours available from mid June - Labor Day. Off-road parking. No dogs allowed. In 1879, miners established the Beldon tent camp, hoping to strike it mineral rich. On July Fourth of that year, they hit pay dirt and renamed the camp Independence. After a short heyday, with a population of 500, in 1881, the expansion of the railroad system garnered the use of the treacherous pass unnecessary for stagecoach travel. The mine population dwindled, and, with the winter storm of 1899, the worst in the young state's history, all but one resident vacated the town. By 1912, it harbored only ghosts. Independence lives on as an archaeological preserve maintained by Aspen Historical Society in cooperation with United States Forest Service. The remains of the town include, in various states of assemblage, a stable, a general store, two boarding houses, and Farwell Stamp Mill, once used to process mined ore. Guests are welcome to tour the grounds and let their imaginations roam. Preservationists do ask, however, that no souvenirs be taken from the site. Travelers can find Independence, at 10,900 ft. elevation, on Highway 82, just 16 miles SE of Aspen, CO. The historic site lies between Roaring Fork River and the highway, four miles from the summit of Independence Pass. Off-road public parking is available. Access to Independence Ghost Town depends on road closures. Colorado Department of Transportation closes Independence Pass (Highway 82), the only approach to this ghost town, for the winter around Halloween and reopens around Memorial Day. For current road closure information, visit www.cotrip.org, call (303) 639-1111 or dial 511 from inside Colorado State. For more information call (970) 925-3721 or visit www.aspenhistory.org/tours/independence-ghost-town/.